You know how sometimes someone you care about gives you a gift that you know means a lot to them and you feel kind obligated to wear it? Like if your toddler makes you a macaroni necklace. Or you grandmother brings you back a super-gaudy Murano glass pin from Italy. 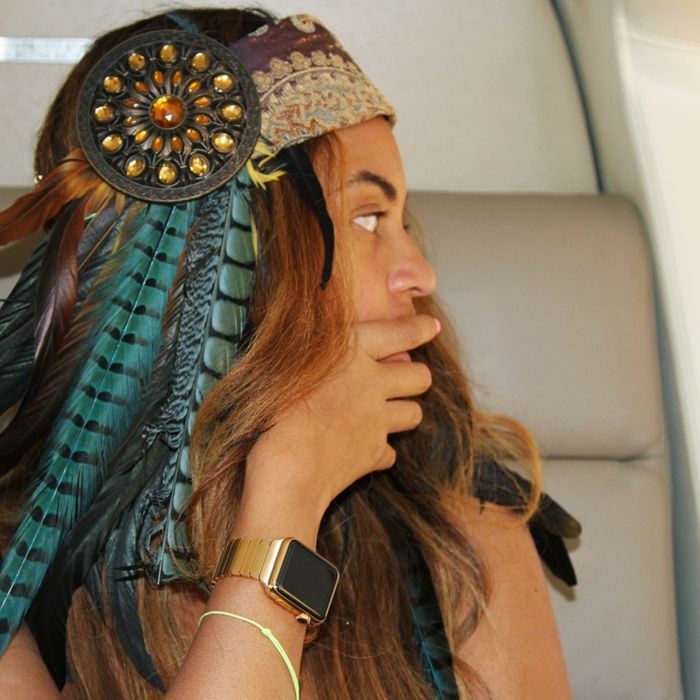 That’s probably how Beyoncé felt upon receiving this second-of-its-kind 18-carat-gold Apple Watch Edition, with custom all-gold link bracelet (Karl Lagerfeld was the first celeb seen sporting this tech bauble). “Oh, that’s cute,” she might have said, slipping it on without even pausing to reorient the interface, and graciously snapping a pic for posterity. Successfully targeted! Right in the festival fashion/Queen Bey sweet spot.